At a recent Tech Sol­i­dar­i­ty NL meet­up we dove into Val­ue Sen­si­tive Design. This approach had been on my radar for a while so when we con­clud­ed that for our com­mu­ni­ty it would be use­ful to talk about how to prac­tice eth­i­cal design and devel­op­ment of tech­nol­o­gy, I fig­ured we should check it out. For the meet­up, I read a hand-full of papers and cob­bled togeth­er a deck which attempts to sum­marise this ’framework’—the term favoured by its main pro­po­nents. I went through it and then we had a spir­it­ed dis­cus­sion of how its ideas apply to our dai­ly prac­tice. A report of all of that can be found over at the Tech Sol­i­dar­i­ty NL web­site. Below, I have attempt­ed to pull togeth­er the most salient points from what is a rather dense twen­ty-plus-slides deck. I hope it is of some use to those pro­fes­sion­al design­ers and devel­op­ers who are look­ing for bet­ter ways of build­ing tech­nol­o­gy that serves the inter­est of the many, not the few. What fol­lows is most­ly adapt­ed from the chap­ter “Val­ue Sen­si­tive Design and Infor­ma­tion Sys­tems” in Human–computer inter­ac­tion in man­age­ment infor­ma­tion sys­tems: Foun­da­tions. All quotes are from there unless oth­er­wise not­ed. The depar­ture point is the obser­va­tion that “there is a need for an over­ar­ch­ing the­o­ret­i­cal and method­olog­i­cal frame­work with which to han­dle the val­ue dimen­sions of design work.” In oth­er words, some­thing that accounts for what we already know about how to deal with val­ues in design work in terms of the­o­ry and con­cepts, as well as meth­ods and tech­niques. This is of course not a new con­cern. For exam­ple, famed cyber­neti­cist Nor­bert Wiener argued that tech­nol­o­gy could help make us bet­ter human beings, and cre­ate a more just soci­ety. But for it to do so, he argued, we have to take con­trol of the tech­nol­o­gy. To address these con­cerns, Val­ue Sen­si­tive Design was devel­oped. It is “a the­o­ret­i­cal­ly ground­ed approach to the design of tech­nol­o­gy that accounts for human val­ues in a prin­ci­pled and com­pre­hen­sive man­ner through­out the design process.” It has been applied suc­cess­ful­ly for over 20 years. In a nar­row sense, the word “val­ue” refers sim­ply to the eco­nom­ic worth of an object. This is not the mean­ing employed by Val­ue Sen­si­tive Design. Val­ues should not be con­flat­ed with facts (the “fact/value dis­tinc­tion”) espe­cial­ly inso­far as facts do not log­i­cal­ly entail val­ue. “Is” does not imply “ought” (the nat­u­ral­is­tic fal­la­cy). Analysing the ways in which a par­tic­u­lar tech­nol­o­gy sup­ports or hin­ders par­tic­u­lar val­ues. Who are the direct and indi­rect stake­hold­ers affect­ed by the design at hand? How are both class­es of stake­hold­ers affect­ed? How should we engage in trade-offs among com­pet­ing val­ues in the design, imple­men­ta­tion, and use of infor­ma­tion sys­tems (e.g., auton­o­my vs. secu­ri­ty, or anonymi­ty vs. trust)? Should moral val­ues (e.g., a right to pri­va­cy) have greater weight than, or even trump, non-moral val­ues (e.g., aes­thet­ic pref­er­ences)? How do stake­hold­ers appre­hend indi­vid­ual val­ues in the inter­ac­tive con­text? 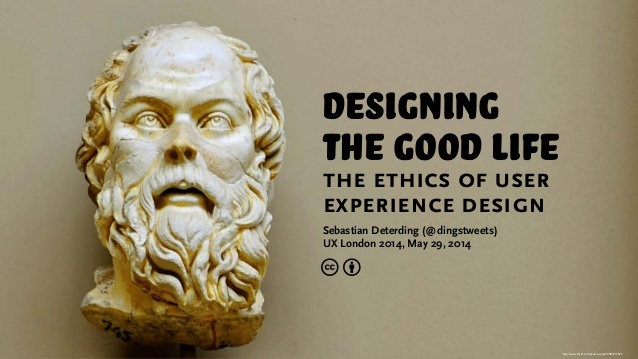 How do they pri­ori­tise com­pet­ing val­ues in design trade-offs? How do they pri­ori­tise indi­vid­ual val­ues and usabil­i­ty con­sid­er­a­tions? Are there dif­fer­ences between espoused prac­tice (what peo­ple say) com­pared with actu­al prac­tice (what peo­ple do)? What are organ­i­sa­tions’ moti­va­tions, meth­ods of train­ing and dis­sem­i­na­tion, reward struc­tures, and eco­nom­ic incen­tives? Val­ue Sen­si­tive Design takes the posi­tion that tech­nolo­gies in gen­er­al, and infor­ma­tion and com­put­er tech­nolo­gies in par­tic­u­lar, have prop­er­ties that make them more or less suit­able for cer­tain activ­i­ties. A giv­en tech­nol­o­gy more read­i­ly sup­ports cer­tain val­ues while ren­der­ing oth­er activ­i­ties and val­ues more dif­fi­cult to realise. Tech­ni­cal inves­ti­ga­tions involve the proac­tive design of sys­tems to sup­port val­ues iden­ti­fied in the con­cep­tu­al inves­ti­ga­tion. Tech­ni­cal inves­ti­ga­tions focus on the tech­nol­o­gy itself. Empir­i­cal inves­ti­ga­tions focus on the indi­vid­u­als, groups, or larg­er social sys­tems that con­fig­ure, use, or are oth­er­wise affect­ed by the tech­nol­o­gy. Below is a list of things that make Val­ue Sen­si­tive Design dif­fer­ent from oth­er approach­es, par­tic­u­lar­ly ones that pre­ced­ed it such as Com­put­er-Sup­port­ed Coop­er­a­tive Work and Par­tic­i­pa­to­ry Design. Val­ue Sen­si­tive Design enlarges the scope of human val­ues beyond those of coop­er­a­tion (CSCW) and par­tic­i­pa­tion and democ­ra­cy (Par­tic­i­pa­to­ry Design) to include all val­ues, espe­cial­ly those with moral import. Val­ue Sen­si­tive Design dis­tin­guish­es between usabil­i­ty and human val­ues with eth­i­cal import. Val­ue Sen­si­tive Design iden­ti­fies and takes seri­ous­ly two class­es of stake­hold­ers: direct and indi­rect. Val­ue Sen­si­tive Design doesn’t pre­scribe a par­tic­u­lar process, which is fine by me, because I believe strong­ly in tai­lor­ing your process to the par­tic­u­lar project at hand. Part of being a thought­ful design­er is design­ing a project’s process as well. How­ev­er, some guid­ance is offered for how to pro­ceed in most cas­es. Here’s a list, plus some notes. This table is a use­ful heuris­tic tool for val­ues that might be con­sid­ered. The authors note that it is not intend­ed as a com­plete list of human val­ues that might be impli­cat­ed. Anoth­er more elab­o­rate tool of a sim­i­lar sort are the Envi­sion­ing Cards. For the ethics nerds, it may be inter­est­ing to note that most of the val­ues in this table hinge on the deon­to­log­i­cal and con­se­quen­tial­ist moral ori­en­ta­tions. In addi­tion, the authors have chose sev­er­al oth­er val­ues relat­ed to sys­tem design. When doing the empir­i­cal inves­ti­ga­tions you’ll prob­a­bly rely on stake­hold­er inter­views quite heav­i­ly. Stake­hold­er inter­views shouldn’t be a new thing to any design pro­fes­sion­al worth their salt. But the authors do offer some prac­ti­cal point­ers to keep in mind. First of all, keep the inter­view some­what open-end­ed. This means con­duct­ing a semi-struc­tured inter­view. This will allow you to ask the things you want to know, but also cre­ates the oppor­tu­ni­ty for new and unex­pect­ed insights to emerge. Laddering—repeatedly ask­ing the ques­tion “Why?” can get you quite far. The most impor­tant thing, before inter­view­ing stake­hold­ers, is to have a good under­stand­ing of the sub­ject at hand. Demar­cate it using cri­te­ria that can be explained to out­siders. Use descrip­tions of issues or tasks for par­tic­i­pants to engage in, so that the sub­ject of the inves­ti­ga­tion becomes more con­crete. Two things I find inter­est­ing here. First of all, we are encour­aged to map the rela­tion­ship between design trade-offs, val­ue con­flicts and stake­hold­er groups. The goal of this exer­cise is to be able to see how stake­hold­er groups are affect­ed in dif­fer­ent ways. When dis­cussing mat­ters of ethics in design with peers I often notice a reluc­tance to widen the scope of our prac­tice to include these issues. Fre­quent­ly, folks argue that since it is impos­si­ble to fore­see all the poten­tial con­se­quences of design choic­es, we can’t pos­si­bly be held account­able for all the ter­ri­ble things that can hap­pen as a result of a new tech­nol­o­gy being intro­duced into soci­ety. I think that’s a mis­un­der­stand­ing of what eth­i­cal design is about. We may not always be direct­ly respon­si­ble for the con­se­quences of our design (both good and bad). But we are respon­si­ble for what we choose to make part of our con­cerns as we prac­tice design. This should include the val­ues con­sid­ered impor­tant by the peo­ple impact­ed by our designs. I think that is an apt place to end it here as well. Fried­man, Batya. “Val­ue-sen­si­tive design.” inter­ac­tions 3.6 (1996): 16–23. Fried­man, Batya, Peter Kahn, and Alan Born­ing. “Val­ue sen­si­tive design: The­o­ry and meth­ods.” Uni­ver­si­ty of Wash­ing­ton tech­ni­cal report (2002): 02–12. Le Dan­tec, Christo­pher A., Eri­ka She­han Poole, and Susan P. Wyche. “Val­ues as lived expe­ri­ence: evolv­ing val­ue sen­si­tive design in sup­port of val­ue dis­cov­ery.” Pro­ceed­ings of the SIGCHI con­fer­ence on human fac­tors in com­put­ing sys­tems. ACM, 2009. Born­ing, Alan, and Michael Muller. “Next steps for val­ue sen­si­tive design.” Pro­ceed­ings of the SIGCHI con­fer­ence on human fac­tors in com­put­ing sys­tems. ACM, 2012. Frei­d­man, B., P. Kahn, and A. Born­ing. “Val­ue sen­si­tive design and infor­ma­tion sys­tems.” Human–computer inter­ac­tion in man­age­ment infor­ma­tion sys­tems: Foun­da­tions (2006): 348–372.